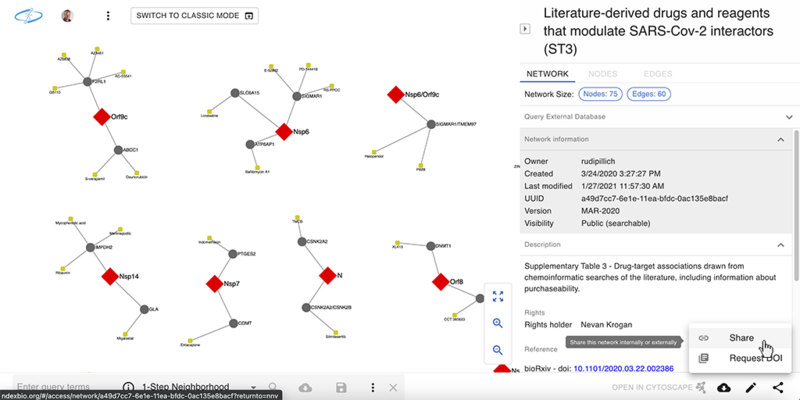 The public NDEx site includes a number of features to promote and support publishing of data in network format. 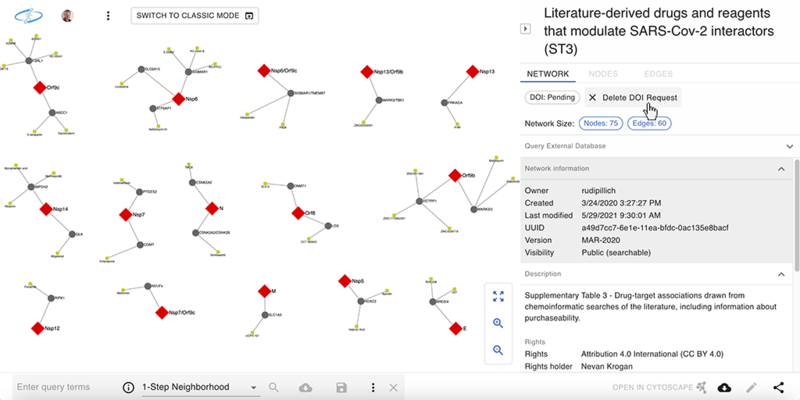 Although published networks will typically be associated with research articles, there are cases where authors will decide to publish network data independently from a canonical scientific journal article. For example, researchers generating networks from large datasets using automated analytic pipelines may wish to make their results available on an ongoing basis. 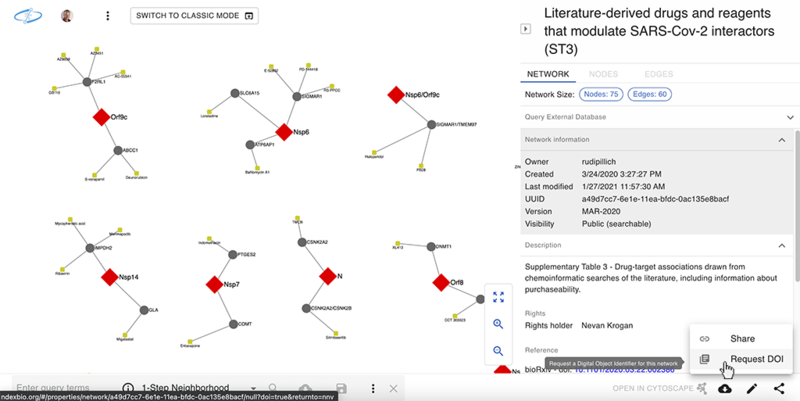 Besides its use in pre-publication and collaborative research efforts, NDEx can also be a useful asset for the publication of networks referenced in peer-reviewed journal articles. 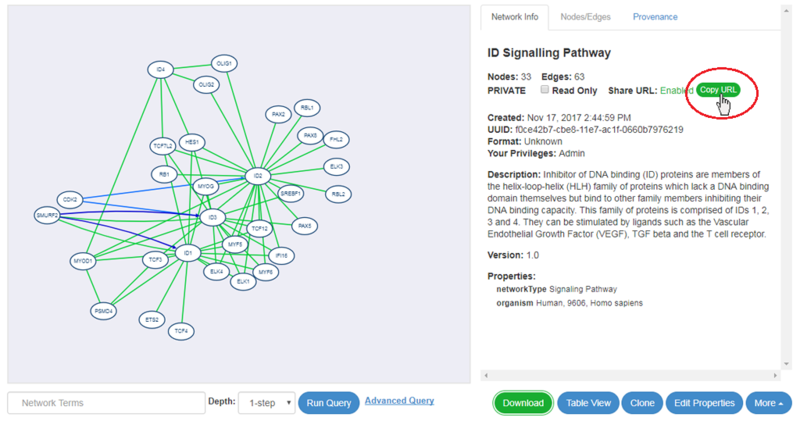 Advantages for authors include easy network storage/retrieval, full Cytoscape integration and DOI minting, while publishers can rely on a simplified submission management (no supplemental data, tables or figures necessary), improved anonymous web-based review process (using interactive networks rather than tabular data) and better/faster access to published data by hyperlinking figures in articles directly to networks in NDEx via URLs or DOIs. The following sections summarize how to use NDEx and its built-in features throughout the entire publication process. 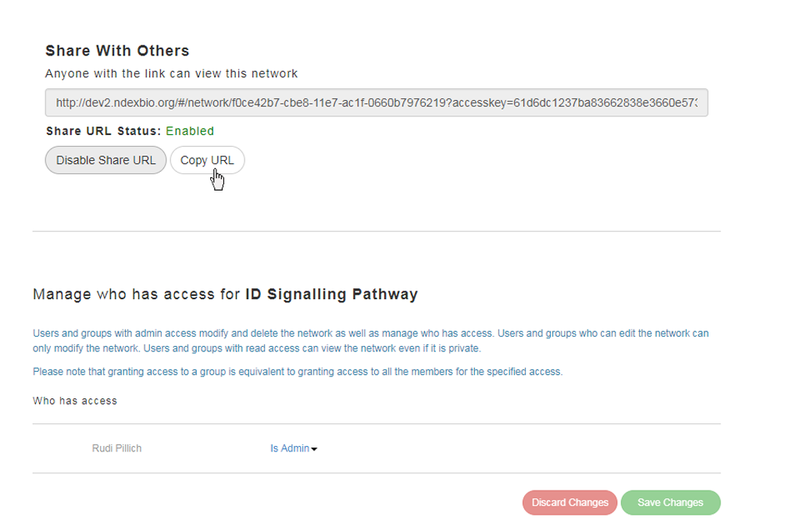 When authors are ready to submit their research paper, they can include URLs in their submission to allow anonymous access to their private networks. These URLs, called "Sharable URLs" are similar to Dropbox or Google Docs links and grant access to the networks ONLY to people that know the URLs (in this case the Journal's editor). After clciking the button, the "Sharable URL" status will change to Enabled and a new "Copy URL" button will conveniently allow you to it copy to your clipboard; then you can paste the URL in an email, include it in a grant proposal or reference it in your article submission. Once the peer-review process is complete and the manuscript officially accepted, authors can use another powerful NDEx feature and "Request a DOI" for their networks to include in the final published article. Please review the next sections for details and important information about requesting and using DOIs and adding a reference. For reproducibility and long term data access, NDEx offers the possibility to request DOIs for any networks. Requesting a DOI for a network ensures that the network will become a stable, immutable resource and guarantees long term access to the underlying data. 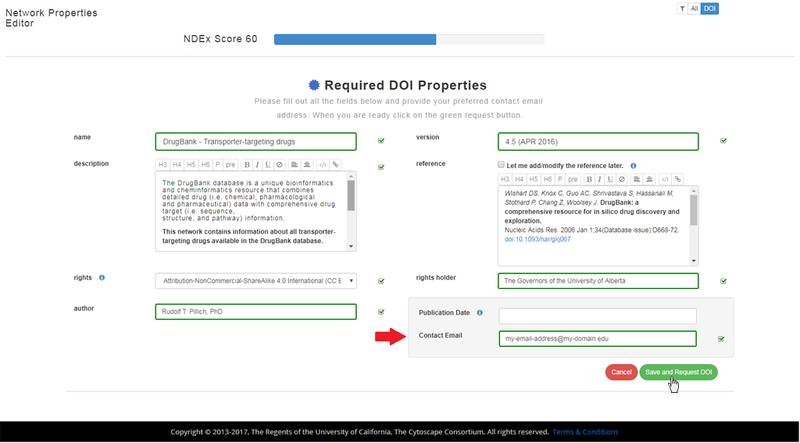 In addition, the DOI can be used in subsequent publications or to submit data to online repositories. 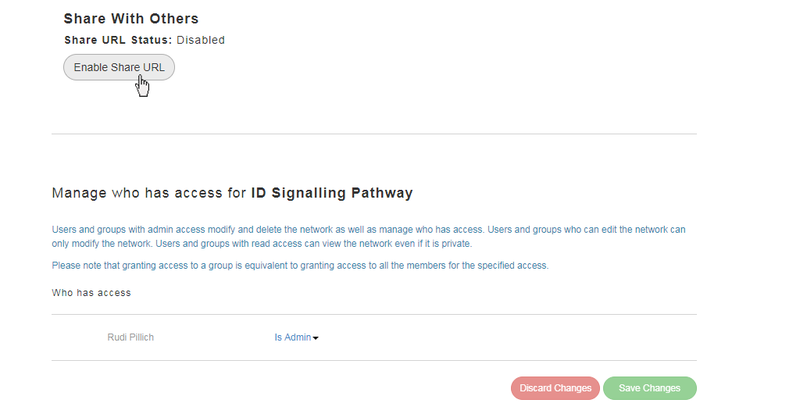 Once the DOI request is submitted, your network will be locked and no furtherchanges will be possible (with the exception of adding/modifying publication reference information as explained below), so it is very important that you check carefully all the information entered in the DOI-required fields before submitting your request! After submitting your request, you will be sent back to the network page and you'll see the DOI status right below the network title. Initially the status will be "Pending" and a link will be displayed to Cancel DOI Request as shown below. Once the DOI is assigned, "Pending" will be replaced by the full DOI while the link to cancel your DOI request will not be available anymore. 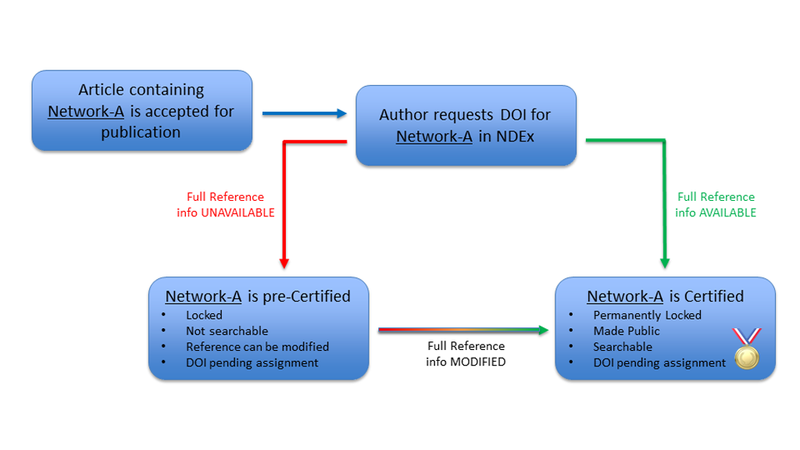 Adding a publication reference to a network is not required to request a DOI; this operation can be performed by the author at a later time (usually after the article referencing the network has been officially accepted for publication) according to your publisher's policies. If the DOI request is submitted without marking the checkbox, the network will be Certified, made Public, permanently locked and DOI will be pending assignment; at this stage, no further changes are allowed on the network. If the request is submitted with the checkbox marked, the network will be pre-Certified, its visibility status will remain unchanged, the author will have a one-time opportunity to add/modify the reference information later and DOI will be pending assignment. This procedure is not automated and we might contact you to obtain additional information prior to assigning a DOI, so it is important that you provide a valid contact email address when submitting your request. This same email address (red arrow in image below) will also be used to notify you that the DOI was assigned. Clcik the green "Save and Request DOI" button to submit your request.